One of the first things we learn as little kids is to always say "thank you" -- and, of course, not to put our mouths on the water fountain, but that's a topic for another day. If someone does you a favor, if you're given a gift, saying thank you is just good manners 101. What I learned during my first days at IMPACT, however, is that it's also inbound marketing 101. A thank you page is the site page that someone is redirected to after filling out a form on your landing page. It's where you bring back your navigation, deliver on the promise made on the last page (i.e. share the eBook, video, etc. ), and most importantly, it's your next opportunity to nurture the lead down the sales funnel. 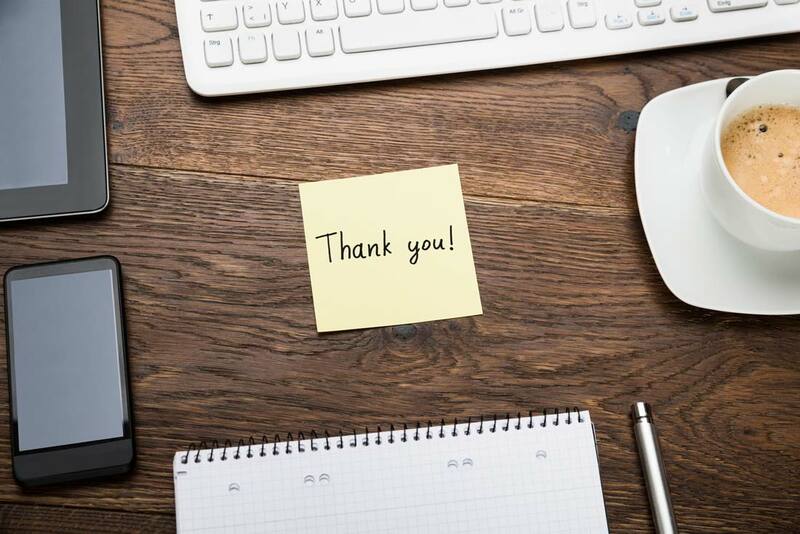 Think of your thank you age as the "impulse zone" of your website. Like a retail checkout line, when a person lands on your thank you page, they have already been "sold." They've already made the big decision to buy (or in this case, share their contact information with your company) and their guard is down. At this point, any additional request seems less daunting (like buying that extra pair of socks with purple robots printed on them sitting next to register), so strike while the iron's hot. Add a secondary form or call-to-action (CTA) to a related offer to guide your lead to the next logical step in the buyer's journey. Like everything in inbound marketing, this strategy should be A/B tested before being implemented across the board, but in my experience, most people have been pleasantly surprised by how many leads "impulsively" fill out the secondary form. Learn how to start creating ridiculously persuasive landing pages and increase your conversions. Start with a message of gratitude. This confirms that the form went through successfully and humanizes the action. Display your website's normal navigation. This makes it's easier for your lead to stick around and explore more content. If applicable, provide your lead clear instructions for how to access their offer. Recommend additional content or resources related to the offer they signed up for, keeping them engaged with your brand and providing even more value. Add social share buttons to encourage them to spread the word about the offer they signed up for. 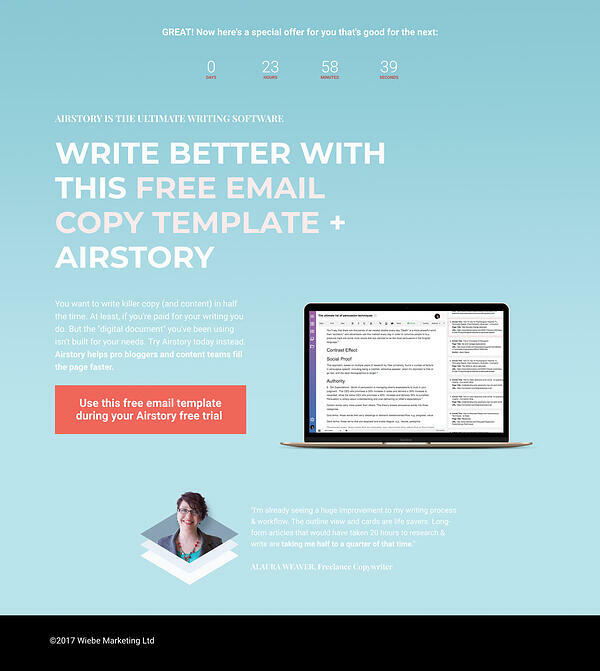 Not only is this thank you page visually beautiful, but it effectively uses urgency (created with a dynamic countdown clock) and a free gift (free email template) to encourage the visitor to take the next step of converting on a free trial of their product, Airstory. They also make the offer even more appealing by including the testimonial and photo of a real Airstory users. 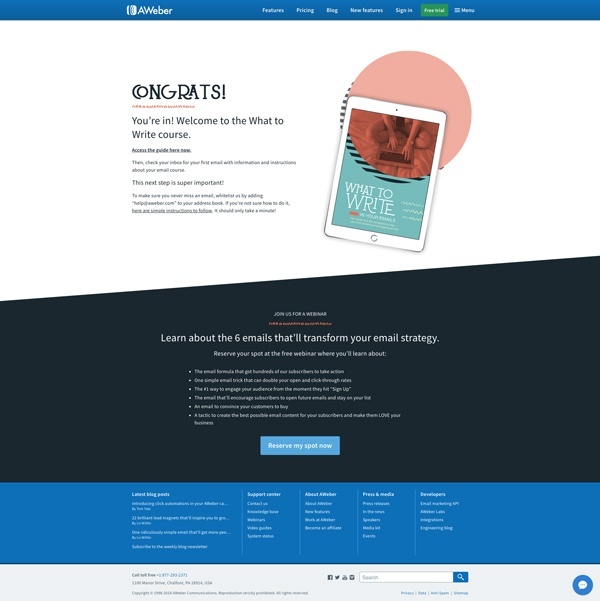 First of all, like CopyHackers, the page itself is beautifully designed. It's clean and its playful use of color and font creates an "upbeat" and optimistic feel that makes you excited for the offer you just got your hands on. Then when you scroll, you are met with a CTA for a related webinar which you might expect. What AWeber does differently, however, is they also show you the webinar in a personalized pop-up window when the thank you page is first loaded. 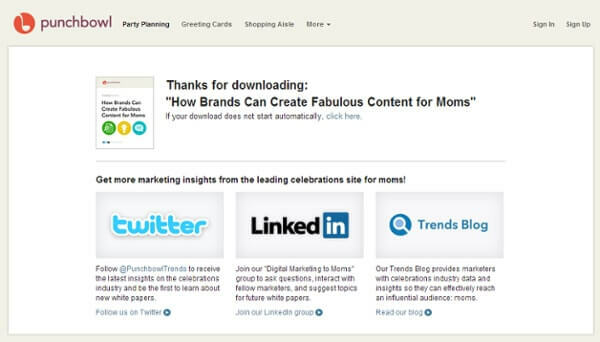 HubSpot nails this thank you page by taking an unconventional approach to nurturing. Rather than trying to move the visitor down the funnel, they use their next step to encourage people to spread the word, building awareness and expanding their reach. The coupon code is a great addition to this thank you page because the people who sign up for this contest have already expressed interest in the product. A 50% discount is going to give most of the people that are on the fence that little extra push they need to give NatureBox. Plus, the coupon is trackable and only available to people after they've given their contact information to the company. 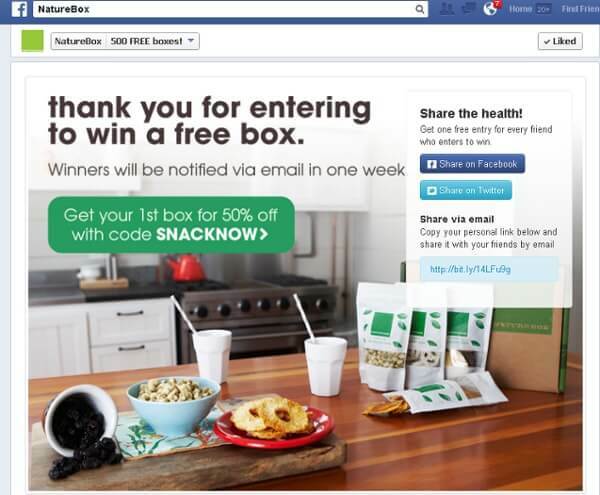 The social sharing links are also a nice touch; making it easier for NatureBox to capitalize on their new leads personal network. Instead of waiting for the confirmation email to hit their inbox, ConversionXL gives their persona multiple options to receive their offer right away on their thank you page. 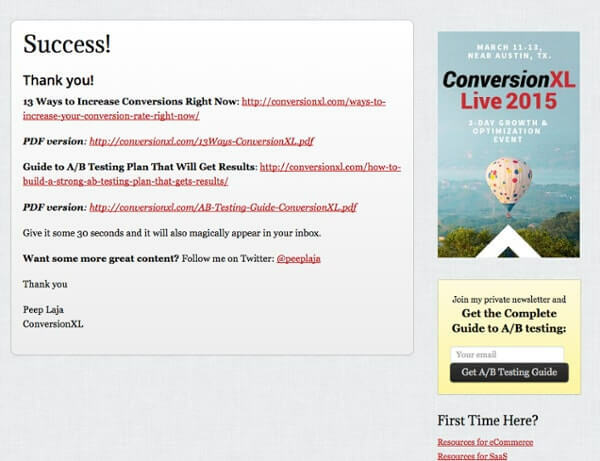 Leads can click a link to view the content as a blog post or they can click to download the content as a PDF. These options not only get impatient leads engaged with their content instantlbut they y, add a little extra bit of "delight." Conversion XL also nails this thank you page by providing a surprise bonus offer and Peep Laja's signature for a more personal touch. Thank you pages can be used for lots of things other than following up on gated content. 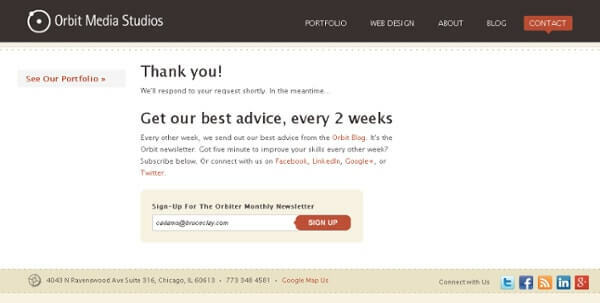 This example from Orbit Media, for instance, is shown to people that have filled out their contact form. Since the person landing on this page has already contacted the company, this is a perfect opportunity to invite them to get them to subscribe to their email and to explain the benefits of doing so. Orbit Media also provides nurturing links to their portfolio, as well as their address and phone number. 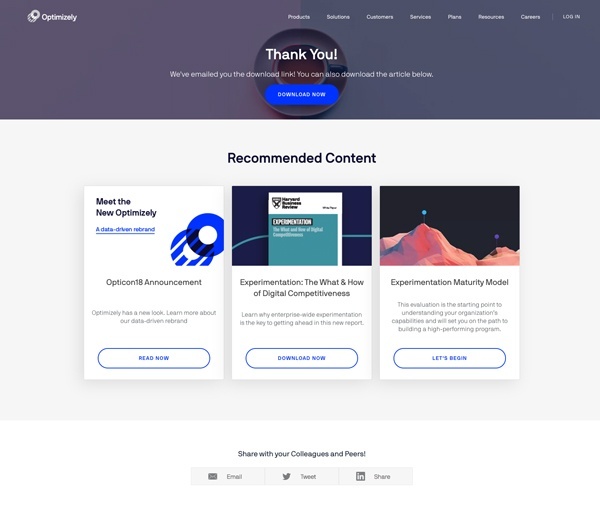 In this example, Optimizely (who we can safely assume tested this thank you page) does a great job of nurturing visitors to related content including articles, premium offers, and tools. They also make a play for expanded reach including handy social share links to spread the word to your friends. 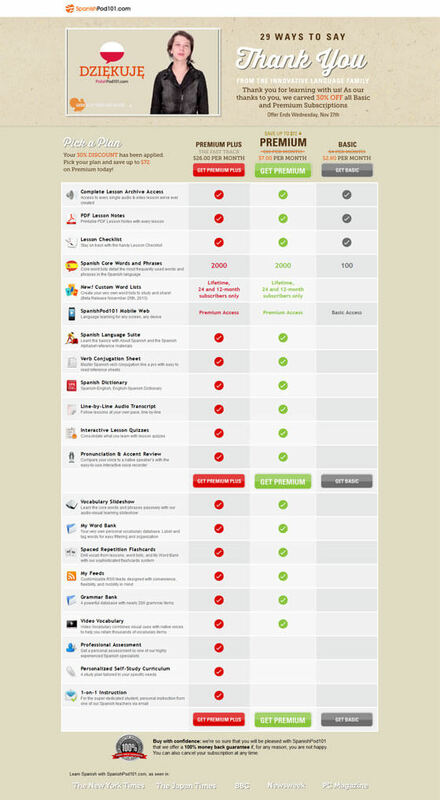 This is a thank you page shown to customers that have just upgraded their software. When a customer is happy enough to upgrade, it's a perfect time to connect with them and Roboform gets that by requesting referrals. 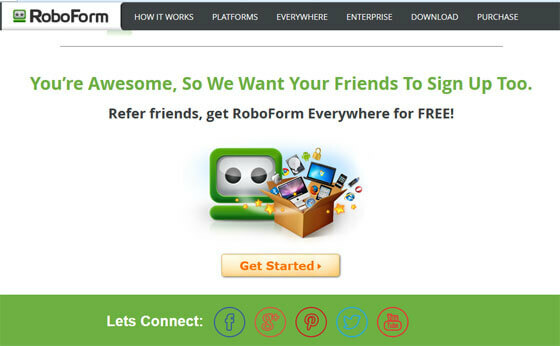 In addition to the referral program, RoboForm also links their social media pages to encourage their customer to further engage with their brand. On this thank you page, Punchbowl provides an additional link to download the resource if it doesn't automatically start. It's always a good idea to provide a safety net like this, as errors are common on mobile devices. On another note, rather than just displaying their social media icons, Punchbowl takes the time to explain exactly what their persona can expect by engaging with their brand on Twitter, LinkedIn, and Trends Blog. This thank you page not only gives confirmation, but it serves as an opportunity to upsell. In addition to the full list of features/benefits for their premium plans, SpanishPod offers a 30% coupon with an expiration date to create a sense of urgency and motivate their persona to make a purchase quickly. Smart move on their part! The clever team also builds trust by including a guarantee at the bottom of the page and an "as seen on" section that reassures their persona that their brand is reputable. Plus, what better way to say thank you for signing up for a free language learning account than a video that says expresses this gratitude in 29 different languages?